Worldwide Shipping - we send 1000's of parcels internationally every year! Camping World is still very much family owned and run, with six family members actively involved with the day to day operations of the company. Supported by a hand picked staff of over 55 experienced and dedicated store staff and managers, Camping World aims to offer the best customer service in the industry. One thing to be sure of is that at Camping World we are fanatical about camping and this is followed through with our product range: if we wouldn't use it, we won't stock it - it's as simple as that! We not only have our award winning website which ships worldwide, we have three large retail stores in Sussex, Essex and Dorset. You can also collect items from our shops and warehouse premises in Hampshire. All three retails stores have fantastic purpose-built tent dispays up all throughout the camping season. 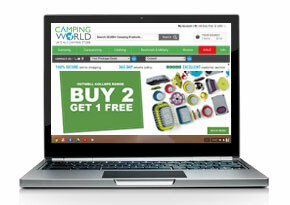 Camping World and Campingworld.co.uk are trading names of Camping and Leisure World Limited, registered in England and Wales number 4231477. Registered office address: Camping World, Unit 4 Blackwater Trading Estate, 26 Blackwater Way, Aldershot, Hampshire, GU12 4DJ. GB VAT number 868 763 363.